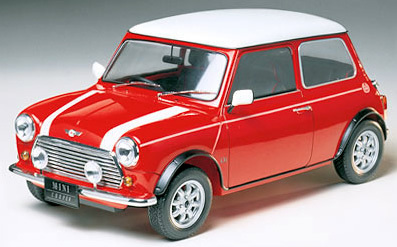 << Back TAMIYA "Rover Mini Cooper 1.3i"
TAMIYA "Rover Mini Cooper 1.3i"
Since wooing the automotive world in 1959 and then the racing world in the 1960's, the Mini has always kept a high level of popularity. Despite production ceasing in 1971, popularity never declined, and in 1991 a 1.3 liter engine Mini Cooper was unveiled, quenching the thirst of Mini fans all around the world. Keeping the compact form and pleasing performance, the updated Mini was loaded with modern fittings including electronic fuel injection system. 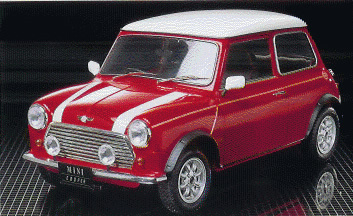 *Model accurately replicates 1992 1.3i Mini Cooper in large 1/12 scale. *Engine, transmission, radiator, suspension, interior seats, door pockets etc. all perfectly reproduced. *Engine hood opens and closes after assembly allowing display of engine and transmission parts. *Includes realistic rubber tires and high quality decals to add that finishing touch.